Will US Elections Be Postponed? For quite sometime, people have been speculating on whether George Bush will find a way to remain in office, especially those who believe that he is Gog and the last president in the closing hours of the American Empire which is already burning down. Bush himself even joked about it in an interview given last week. What I'm wondering now is this. Is the report today of John McCain's announcement of his intent to postpone the debate and halt his campaign activity plus Obama's telephone conversation with Pres Bush last night which resulted in his agreement to come to Washington to sit with him and McCain to formulate a plan for dealing with the economic crisis... Is this a prelude to a joint announcement of intent to suspend the elections "for the good of the country" until the crisis is past? "Now is a time to come together — Democrats and Republicans — in a spirit of cooperation for the sake of the American people," they said. "This is a time to rise above politics for the good of the country." Anyone in the market for a Prime Minister? (IsraelNN.com) Hollywood producers were among big donors to Foreign Minister Tzipi Livni's campaign to replace outgoing Prime Minister Ehud Olmert as leader of the Kadima party and to form a new government. She also received large financial backing from East Coast millionaires, according to campaign contribution lists quoted by The Marker. Her chief opponent, Transportation and Road Safety Minister Shaul Mofaz, won financial support from Jews with lineage from his native Iran. Among contributors to Foreign Minister Livni are men involved in a projected development of a hotel in Herzliya. Scientists say the weakening of solar wind appears to be due to changes in the sun's magnetic field, but the causes of these changes are unknown. 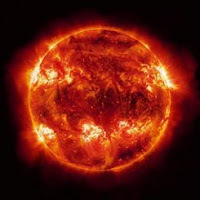 The sun normally experiences 11-year-cycles between periods of great activity and lesser activity. ...recent results, ...show that "we are in a period of minimal activity that has stretched on longer than anyone anticipated." GALVESTON, Texas - Galveston residents returned to the island city Wednesday for the first time since Hurricane Ike roared through, KPRC Local 2 reported. Thousands of vehicles poured into the island when the checkpoint was opened shortly before 6 a.m. Traffic on the Gulf Freeway was backed up about eight miles to Texas City. Some residents brought in U-Hauls and trailers filled with supplies, food and items they took when they evacuated. Dozens of law enforcement officers were out in force to manage traffic. Traffic signals on the island do not work and many turn lanes have been blocked off to help prevent gridlock. ...Officials estimated that 75 percent of the businesses and homes on the island are not fit for habitation. 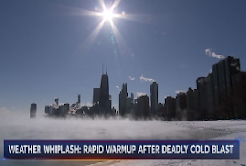 City leaders want residents to be prepared to look and leave, and not expect to stay right away. ...In Galveston, approximately 30 percent of the city has electricity. But residents cannot turn on electric or natural gas meters until they have been inspected. Water service is almost restored, but city water is still not fit to drink. Only the most rudimentary medical services are available and the few hotel rooms available are filled. Galveston residents were asked to bring their own food, water and gas if they expect to stay because those items are in short supply. City officials recommended that residents who have not had a tetanus shot in the past 10 years get one. A curfew of 6 p.m. to 6 a.m. is also in place until further notice. Curfew violators will be subject to a $2,000 fine. (IsraelNN.com) Northern and central Israel may get the first raindrops of the season after the current warming trend ends Monday night. Temperatures will drop sharply Tuesday and Wednesday, rise slightly on Thursday and Friday and fall again on the Sabbath and next Sunday. Local rain is forecast on Wednesday with more serious precipitation probable on the Sabbath and next Monday. The thermometer is expected to fall to the mid-teens (60s F) at night and to 8 degrees Celsius (46 F) on the Hermon mountains. One long-range forecast based on American weather models predicts that Israel will receive heavier than usual and much-needed rain this winter. Whether we get the first rain this week or only after Sukkot, I do believe that the drought will end and we will have abundant blessed rain this winter. There are many signs that point to the tide having turned for us. I believe things are going to get better and better (in Israel) from now on. Wait and see! Three missionaries tried to deceitfully convert to Judaism in religious courts around the world, only to be foiled by Yad L'Achim . A few weeks ago, a distinguished-looking professor of international law showed up at Chabad house of Geneva headed by Rabbi Mendel Pewzner asking to convert to Judaism. He made an excellent impression, dressed in a suit and hat and displaying broad knowledge of Judaism. Most importantly, he appeared very sincere in his desire to accept upon himself the yoke of Torah and mitzvos. As the man began making inroads into the kehillah, attending services and being invited into homes, Rabbi Pewzner got an urgent message from Yad L'Achim in Israel: The newcomer was a missionary. Yad L'Achim backed up its charge with evidence that the man was a Mormon and active in missionary activity around the world. Moreover, Yad L'Achim presented eye-witness testimony that during the very time that the man was in shul, in his religious Jewish garb, he was trying to convince tourists visiting the place to convert out of Judaism. The final evidence, which left no doubt as to the man's intentions, was a statement attributed to him that he wanted to become a Jew because it would be easier for him to operate among Jews, since he could pass himself off as one of them. While the kehillah, armed with this critical information, banished the man from its midst, the story doesn't end here. The jurist moved on to Israel and appeared before a beis din for conversion declaring his "sincere" desire to become a Jew. Yad L'Achim, which kept the impostor on its radar, was quick to present the members of the beis din with its evidence. With a persistence that is characteristic of missionaries, the man moved on to Rome, where he turned to a local beis din for assistance. Yad L'Achim tripped him up again, presenting Rabbi Gad Eldad, a member of the conversion court in Rome, with the facts. The learned law professor is not the first missionary to try to convert to Judaism to be able to infiltrate the Jewish community. Nor is he the first whose efforts were stymied by Yad L'Achim. A couple from Frankfurt, Germany, members of a missionary cult, recently began the process of conversion with the Rabbinical Council of America. But the council's beis din rejected their application after receiving incriminating information from Yad L'Achim. Harav Shalom Dov Lifschitz, chairman of Yad L'Achim, revealed that he recently sent an urgent appeal to conversion courts around the world asking that applicants sign a statement disavowing their belief in Christianity before their application will be considered. "It isn't foolproof, but it will put up a barrier because their religious beliefs forbid them from making such a declaration," he said. "We have to understand that there are missionaries who are seeking to convert to Judaism – and receive Israeli citizenship as a result – as a means of advancing their missionary efforts. Every step must be taken to stop them." ...it must be comforting to know that your neighborhood military battalion knows what it feels like to be tasered. ...They may be called upon to help with civil unrest and crowd control or to deal with potentially horrific scenarios such as massive poisoning and chaos in response to a chemical, biological, radiological, nuclear or high-yield explosive, or CBRNE, attack. The brigade will not change its name, but the force will be known for the next year as a CBRNE Consequence Management Response Force, or CCMRF (pronounced “sea-smurf”). “I can’t think of a more noble mission than this,” said Cloutier, who took command in July. While soldiers’ combat training is applicable, he said, some nuances don’t apply. “If we go in, we’re going in to help American citizens on American soil, to save lives, provide critical life support, help clear debris, restore normalcy and support whatever local agencies need us to do, so it’s kind of a different role,” said Cloutier, who, as the division operations officer on the last rotation, learned of the homeland mission a few months ago while they were still in Iraq. Yeah, right! With "spike strips...; shields and batons; and, beanbag bullets." Oh, and don't forget the tasers! Very comforting indeed. Considering the staggering news events of last week, from the destruction of Hurricane Ike to the near collapse of the greatest economic engine the world has ever seen, what might next week bring? "Who is this coming from Edom, with soiled garments, ... Why is Your clothing red, and your attire like one who trod in a wine press? "A wine press I trod alone, and from the peoples, none was with Me; and I trod them with My wrath, and I trampled them with My fury, and their life blood sprinkled on My garments, and all My clothing I soiled. For a day of vengeance was in My heart, and the year of My redemption has arrived." A disturbing communication posted in a high level Arabic language forum suggests that some type of terrorist operation is currently underway, targeting sites within the United States and Europe. According to information developed within the last 24 hours by a deep-cover intelligence operative, Islamic terrorists have been dispatched to the U.S. and Europe and may be in place, preparing to execute unspecified terrorist attacks within the U.S. and Europe. "I decided to resign, with pain, not with pleasure, I must say, really with pain," a tired-looking, casually-clad Olmert told a gathering of students in the Negev. "I know that there are still many things to do, that I wanted to do, that I believe I could have done. I have no bitterness. I have no anger." He's got nothing left to lose. ...[A] source said Olmert told President Shimon Peres that he wanted to submit his resignation to the president only after Rosh Hashanah and Peres' return from New York, not before October 2. Meanwhile, Olmert will continue negotiating with Palestinian Authority President Mahmoud Abbas, with whom he met Tuesday. Sources close to Olmert said "the gaps are very small and in two or three more meetings, it may be possible to reach an agreement." Cabinet Secretary Oved Yehezkel reportedly met a few days ago with Peres to coordinate the date of Olmert's resignation. Olmert himself is said to have called Peres a number of times and had long phone conversations on the matter. ...By law, Olmert must announce his intention to resign and only then submit his resignation. Olmert's bureau decided that even if the race were determined in the first round, Olmert would only announce his intention to resign at Sunday's cabinet meeting. "Bush Quips He Might Stay in Power"
At a press briefing this morning that touched on issues like the White House's extrajudicial wiretapping program and torture policies, the president was asked a question about Vladimir Putin's plan to hold on to power when his term as Russian president runs out. Ahahahahaha. That's funny. It's a great comedian who can give voice to what everyone else is just thinking. TEHRAN, Iran: Iran's Seismological Center says a magnitude-5 earthquake has cut electricity and caused panic on Iran's Qeshm island in the Persian Gulf. ...Wednesday's earthquake was the second strong temblor to hit Qeshm in a week. On Sept. 10, a magnitude-6 quake killed seven people and injured 40 others. It sent tremors across the Gulf and shook the skyscrapers of Dubai. Add to the following the fact that Olmert's days are numbered and the picture is rosy indeed. Eisav is clearly on his way (quickly) down the 'ladder.' That means Ya'akov is on the way up. (IsraelNN.com) The shekel is continuing its sharp appreciation against leading currencies, breaking new thresholds despite major losses on Wall Street, the US government bailout of insurance giant American International Group (AIG), the bankruptcy of Lehman Brothers Holding, and the sale of Merrill Lynch to Bank of America. (IsraelNN.com) The Pomegranate crop in Israel is expected to reach a record high of 20,000 tons this season, 25 percent higher than last year's yield. Nearly 25 percent of the fruit will be exported. "A Prime Minister in Israel should be democratically elected by the entire nation," Saar said this morning, "and not by 431 party members. Forming a new government in these circumstances would be a legal farce that would strike a clear blow at Israeli democracy." (IsraelNN.com) "The notion of a Greater Israel no longer exists, and anyone who still believes in it is deluding themselves," said Ehud Olmert, in what is likely to be his last cabinet meeting as Prime Minister. "Forty years after the Six Day War ended, we keep finding excuses not to act. This isn't doing Israel any good,” said Olmert to the members of his cabinet. ...“We have to ask ourselves is losing a hill here or there, is worth forfeiting the chance to achieve something. This is why I say that this is the time to discuss the evacuation-compensation . We have to keep pushing it, and eventually bring it before the government,” he noted, referring to a proposal put forth by Chaim Ramon, former Minister of Justice and current Vice-Premier. (IsraelNN.com) Prime Minister Ehud Olmert said Wednesday that Israel spent 40 years investing its energy on Judea and Samaria – in vain. "We invested the emotional resources and our thoughts in 'how to build Judea and Samaria' but history made it clear to us that the state of Israel has other realistic and practical alternatives," Olmert said in a speech at the Ashalim students' village. "The future of the state of Israel will not be in our mixing with the Palestinians but in the empty parts of the land that are thirsting for our entrepreneurial and inventive drive," he added. "For forty years we invested the energy of our souls in order to build up a place from which, in retrospect, we see that the land shall not be built. I say this carefully, with respect and circumspection," he said. "I have great appreciation for the people who built their homes in those places and in the past I, too, supported them." It's Olmert's mouth moving, but it's the Sitra Achra speaking. They're gonna have to pick Olmert up and remove him , chair and all, because he won't let go of it willingly. Like Paro (and countless others) before him, he has deluded himself and is convinced that he can not fail or fall. That usually means that the failure and the fall are imminent. (IsraelNN.com) Prime Minister Ehud Olmert has offered Palestinian Authority (PA) chairman Mahmoud Abbas more "goodwill gestures" despite the Kadima elections that will determine his replacement as party leader and head of the government, PA sources said Wednesday. He apparently has backtracked on his stated promise to quit the day after the elections. One of the gestures he promised Abbas at a meeting on the eve of the leadership elections is the release of more Arab terrorists. Prime Minister Olmert had promised to resign after a new leader is chosen, but he can remain in power for several weeks while his replacement tries to form a new government, which is not a certainty. If the new party leader is unable to form a government, President Shimon Peres will ask another party leader to carry out the task or order new elections. Prime Minister Olmert's reported promise of more compromises and concessions to the PA may be challenged by opposition parties, who can ask Attorney General Menachem Mazuz to rule that he has no right to make policy decisions while he is a "lame duck" prime minister. Mazuz recently denied a petition that he declare the government to be in "transition" and to limit Olmert's flexibility. If one of the four candidates wins Wednesday's election on the first round with at least 40 percent plurality, the Olmert administration will legally be one that is temporary. Sources quoted by Chinese news agency Xinhua also stated that Abbas asked Prime Minister Olmert to offer more facilities to Arabs at the Al Aqsa mosque on the Temple Mount, to take down more checkpoints and roadblocks and to free Marwan Barghouti. The Tanzim terrorist head is serving five life terms in prison for planning deadly terrorist attacks that resulted in the murders of numerous people. Prime Minister Olmert replied he would free him by the end of the month, Xinhua reported. Prime Minister Olmert already has granted permission to the Muslim custodians of the Temple Mount to repair and restore verses from the Koran that were carved into several Muslim buildings on the Temple Mount, according to WorldNetDaily reporter Aaron Klein. Special tools and machinery for repairing the verses have been stored in Ashdod for three years, Klein reported. And all in the month of ELUL!! When you see certain words or phrases being repeated very prominently, you can be sure they contain a message. Obama, whose slogan has long been “Change We Can Believe In,” has since the end of the Democratic National Convention in late August altered his rallying cry — and not because it ends in a preposition. Besides political change, we've been hearing a lot until now about climate change---major change---and we're both seeing it and experiencing it. There's actually a double message here. The Jewish People must change direction and change their ways, i.e. do teshuva, because Hashem is preparing the world for the biggest change of all---Days of Mashiach! US Headed For $10.00 A Gallon Gasoline? ...We are falling into a kind of chaos. This chaos appears in our economic behavior – in our indebtedness and failure to observe the traditional rules of economy. We have also ignored the warnings of our forefather’s money and credit. And we have lost our common sense in matters of money and finance. We fought a war on drugs but did not realize that the devil’s most powerful drug is credit. Is there any doubt that human beings cannot resist its addiction? We are now beyond the point of no return. ...The problem is that what is occurring in terms of birth pangs are not fully appreciated. At some point Americans will realize what has happened to them and their financial system. The perversity of money and the financial system to do the very opposite of what all reason indicates should not deceive us from understanding reality. The fact that so many people do not see the tremendous peril we are in does not change reality. Over time people have lost touch with the great truths of economic life. The consequences of this insensitivity to these truths are to be unperturbed, irrational, and indifferent to signs of imminent disaster. We are blind to enemy identification. We cannot see clear and present danger. The new financial alchemy has created a complexity , a deception, and a structure which exceeds what is humanly manageable. A single event could cripple our economic life and collapse our financial system. It is only a matter of time. The Ten Sigma Event is like the ten plagues of Egypt. The plagues are happening again in a different form but the message is the same. The truth will be set free. I think we are at the stage of “tomorrow about this time I will cause it to rain a very heavy and dreadful fall of hail.” Those who got their servants and livestock into houses and shelters were not destroyed. Some ignored the message and did not believe it and they lost everything. It is hard to hear a message of counterculture financial warning. Money has become so complex that it has been confusing. So many new forms and extensions of money have flooded our lives. Debt has been confused as wealth and has been an addiction unto itself. There is a reason that gold is called “precious” metal. The financial elite of the United States have sacrificed the system’s survival for the greatest financial gains of all history. The system itself is dead and it is all theater from here on. As the financial plagues unfold may I suggest you “urgently ask for gold and silver”. Rabbi David Dudkevitch, the rabbi of the West Bank settlement of Yitzhar, was not present last Shabbat when dozens of Yitzhar residents avenged the stabbing of a boy from the settlement by going on a rampage of shooting and destruction in the neighboring village of Asira al-Kabiliya. He was there in spirit, however. Dudkevitch, who is highly respected in Yitzhar, is generally media-shy, but this time, he made an exception. "The proper and healthy thing, and this applies to the events of Shabbat as well as in general, is for the Israel Defense Forces to be involved not only in apprehending terror suspects, but also in collective punishment, up to the level of reprisals, of the environment that supports terror," Dudkevitch told Haaretz Monday. "In the past, the State of Israel did this. But [today], just as it did in Gaza, with one hand it acts against terrorists and Katyusha launchers and with the other it feeds them and their families and cultivates the soil from which terror grows." "Most of the Arab population - in the Galilee, the Triangle and in Judea and Samaria [the West Bank] - desires the destruction of the state," Dudkevitch continued. "Some of them say this in Western-democratic disguise, others say it without masks." According to the rabbi, 80 to 85 percent of local Arabs "hope and scheme to destroy the sovereignty of the Jewish people in our land," and therefore, "their emigration should be encouraged." "There will be many opportunities, both by encouraging and by deporting, but we must start with encouragement, with a general statement. That's the minimum." 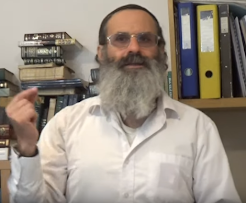 Dudkevitch, 44, has been dubbed the rabbi of the "hilltop youth," and as such he expresses surprise when asked why Yitzhar is not surrounded by fences, which might have prevented the infiltration of the knife-wielding terrorist on Saturday. "I am amazed to be asked that," he said. "The Bible says that when people 'sit in [fenced] camps' it radiates fear and unnaturalness, while when they are in open towns, it is a sign of strength, confidence and heroism. Let the Arabs, not the Jews, live within fortresses, fenced in. There are settlements that have agreed to be fenced in. I don't judge anyone. In Yitzhar we chose otherwise. There is so much land surrounding the settlements that the Arabs never thought of approaching them, and those that fence themselves in lose a huge amount of land." In recent years, Dudkevitch has become identified with a strain of religious Zionism that distances itself from the symbols and institutions of the state. He does not reject this image. "Unfortunately, the State of Israel, and especially its judicial system and its constitution, has in recent years chosen to place nearly every Jewish element into a universal, rather than Jewish, definition. It still glories in the title of a Jewish-democratic state, or democratic-Jewish, but in nearly every respect, particularly that of sovereignty, there's nothing to back that up. The state stole the state from the Jews, and sovereignty is attributed to all its citizens and not to the Jewish people throughout the generations." "Against this background," he continued, "it's obvious that a great many people who are secure in their Judaism feel emotionally distant from the state, which is in another place altogether. This has a very high price, because citizens who find it hard to identify with their state - that is very damaging. When traitors to their state are allowed to serve in the Knesset and become part of the decision-making process, how can anyone, first of all on the emotional level, identify with that state?" In light of the possibility that additional territory and Jewish communities in Judea and Samaria will be evacuated, some of your colleagues are talking about establishing a 'state of Judea' alongside the State of Israel. Do you believe in this? "The State of Israel is not the be-all and end-all. If it decides it does not want to be in the hereditary lands of our forefathers, then other Jews have the right to organize themselves in order to live there, even without a link to the state. Is it practical? I doubt it. That's why I'm not signing up for it. But when there's talk about another expulsion, then on the ideological level, the 'State of Judea' is no worse than expulsion." Over the last 12 months there have been a number of times when informed people thought "this is it." Well if today and this past weekend aren't "it", I don't know what is. We now have multiple large banks fighting for their lives and a 10 day disruption in gasoline supplies coming out of the Gulf Coast, both on the heels of the government nationalizing $5 trillion in mortgages and the Big Three automakers all letting it be known that they're going to need government bailouts as well. And that's before we even get to the crisis in Georgia over the BTC pipeline, the war in Nigeria MEND declared, or the rapidly collapsing climate. About six months ago I wrote on this page it was time to "brace for impact". Now I would say forget about bracing for impact, we are at impact right now. It may take a few weeks, even months, for the smoke to clear but I suspect that once it does, people will look back on mid-September as the day "it" happened. The psychological war for the hearts and minds of Israelis continues. Whether it's the settlers or the chareidim, Torah-observant Jews are being made out to be the enemies of the state and democratic values. The attack on Torah and authentic Judaism and those who adhere to it is felt on many levels. Today, it is being used once again to de-legitimize an entire population so that they may be forcibly removed from their ancestral homes and land. However, its fallout will be felt as far away as Jews have been scattered these last two millenia. These ultra-orthodox are supported by the tax dollars of a state they did not build and did not fight for. Yet they want to dictate to all. Parasites. First: This “state” is supported by the tax dollars of another Nation, so it is not REALLY a “state”, it is a WELFARE CLIENT. Second: Remember how the US bombed and invaded Afghanistan to stop the Taliban from using “modesty” squads? HUH? Remember how all the Jews howled and yelped about the Fanatic Muslims? Looks like we should spread FREEDOM and DEMOCRACY to Israel, at least cut off the CHARITY. I agree there is no difference between any fundamentalist group that wants to control your liberty. However, you must be honest in your assessment. One was supported by the goverenment, this one is a mob mentality. Please be fair instead of inciting the same mob violence as illustrated by this small bunch of fanatics. I have been overly “fair”. WHOSE anti-GENTILE mindset has spread bigotry for millenia? Who is engaged in Ethnic Cleansing of the Native Peoples? The Arabs and Ottoman Turks allowed DIVERSITY in Palestine. It is the current usurpers who could drive Christians and Muslims out. The Zenophobic-Tribalists create the very backlash that they decry. Jews in chu"l are as much at risk as the Jews in Israel. It makes much more sense in such a climate for us to stick together as ONE camp in ONE land in unity and brotherhood, where we can have the greatest impact---our God-given homeland in Eretz Yisrael. Frum Jews in the West, please come home. You are needed HERE to strengthen our numbers and our influence! Sunday night, Barclays and the Bank of America dropped out of bidding to buy Lehman Brothers, the fourth biggest investment bank in the world, and the federal government said there would be no bailout. Ten US and foreign banks have set up a $50bn fund to save troubled companies. The Bank of America opted to save Merril Lynch from buckling instead of Lehman. AIG is also in danger with disastrous effect on the world insurance industry. Tokyo, Singapore and Hong Kong stock exchanges were closed Monday by a holiday and insulated from the backlash from New York, but US stock markets are set to tumble when they open promising Monday will be a financial Ides of September. The collapse of the three biggest names on Wall Street threatens to wipe out many billions of dollars from pension funds and the banking and insurance industries in a worldwide chain reaction. Many comparisons have been made over the last 24 hours between Hurricane Ike 2008 and the Great Hurricane of 1900 which both zeroed in on Galveston, Texas. It has been noted elsewhere that "Ike" is a nickname or shortened version of the name Isaac. Interestingly, a book written about the 1900 hurricane was called "Isaac's Storm." 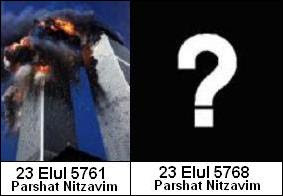 Both storms arrived on Shabbat Parshat Ki Tetzei---the 1900 storm on 14 Elul 5660 and Hurricane Ike on 13 Elul 5768 --- 108 years apart. What does any of this mean? All I know is that it's no coincidence, because we don't believe in coincidences. "The dollar is up in the short term on what we expect is a short covering rally, but that is not consistent with long-term implications, so we don’t expect it to stay up. " "...bail on the summer bubble...."
UPDATE 2 Sep 08: Since posting this, the rate has continued to climb as far as 3.61, but this is due in large part to the hundreds of millions of dollars the Bank of Israel has been buying up. It is worth noting that today, they announced the end of this pratice effective 12 November 2008, which is right in line with the timeframe for the dollar's demise given by the rabbis. (IsraelNN.com) The Bank of Israel announced Tuesday morning it will stop buying US dollars as of November 12. The bank has been buying dollars in an effort to stabilize the dollar-shekel rate, which has been dropping steadily since the beginning of the year. The rate on Tuesday morning was NIS 3.61 per US dollar. "...Several tzaddikim have come out in the past week and provided some financial instructions to their talmidim. Things are going to briefly appear to settle, it's momentarily going to look like the crisis is past. Markets will soar, and the US dollar will regain it's strength. But this will be an illusion (in US market terms, a dead cat bounce). By Hoshana Rabbah this year, it will all unravel and the true impact of the financial crisis will be apparent. Markets will fall to record lows, as will the US dollar. Their instructions to their talmidim are: bail on the summer bubble...."
Could that be what is transpiring now? Houston is flat and it sits very close to sea level 35 miles inland from Galveston Bay. It is crisscrossed with bayous which help to drain it after the water begins to go down, but in a storm surge, the water backs up. 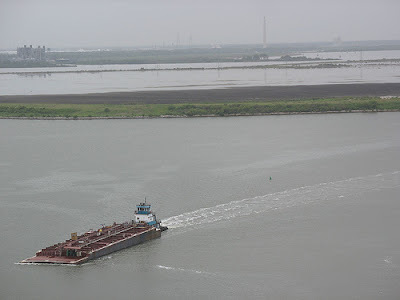 The Houston Ship Channel is as big as a river and makes Houston an inland port. Any tidal surge will bring flood waters right up that channel and into the refineries and chemical companies which line its banks. Because of the direction of air circulation, it is the backside of a hurricane which gets the tidal surge and the higher the wind, the higher the water goes. HOUSTON - Gleaming skyscrapers, the nation's biggest refinery and NASA's Johnson Space Center lie in areas that could be vulnerable to wind and damaging floodwaters if Hurricane Ike crashes ashore as a major hurricane. Forecasters expect the storm to make landfall this weekend somewhere between Corpus Christi and Houston, creating the potential for heavy punishment for Houston even if it's not hit directly. Some forecasts say Ike could strengthen to a fearsome Category 4 hurricane with winds of at least 131 mph over the Gulf of Mexico, and emergency officials warned it could drive a storm surge as high as 18 feet. 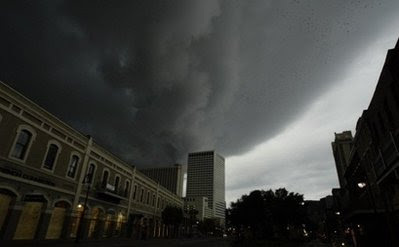 If current projections of the storm's path hold up, the area surrounding Houston — home to about 4 million people — would be lashed by the eastern or "dirty" side of the storm, said meteorologist Jeff Masters, co-founder of San Francisco-based Weather Underground. 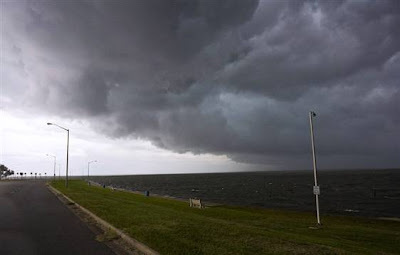 This stronger side of the storm often packs heavy rains, walloping storm surge and tornadoes. "I expect a lot of damage in Houston from this storm," said Masters, adding that Ike could cause a "huge storm surge" affecting at least 100 miles of the Texas coast. ...The surge in Galveston Bay could push floodwaters into Houston, damaging areas that include the nation's biggest refinery and NASA's Johnson Space Center. ...The oil and gas industry also watched the storm closely, fearing damage to the very heart of its operations. Refineries are built to withstand high winds, but flooding can disrupt operations and — as happened in Louisiana after Hurricane Gustav — power outages can shut down equipment for days or weeks. An extended shutdown could lead to higher gasoline prices. Trivia Question: What well-known Jewish figure (currently living) was born in Galveston, Texas? The Big Day for the "Big Bang"
Scientists are today preparing to switch on the world's biggest scientific experiment. The £5billion Large Hadron Collider aims to recreate the conditions moments after the Big Bang that created the universe. Tomorrow morning, it will be switched on and the first attempt to send the particle beam around its entire 27km length will be made. The storm is gone, but its memory lingers. 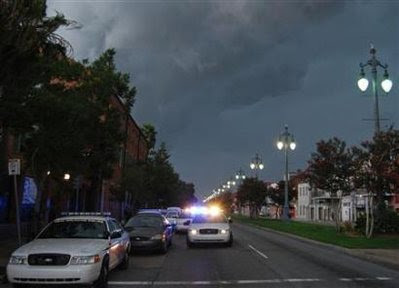 ...The state's power grid sustained severe damage from Gustav, officials say, and it could be weeks before all of it is repaired. Frustrated motorists poured back into the state Tuesday hoping to return home, only to be turned back at checkpoints on all the major highways. Many grew frustrated as they roamed the state like gypsies or sat in motels they could scarcely afford, their cash running low and no way to get more. As a Jew, you may agree and you may not, but when this woman says "God" you have to understand that for her, that means J*sus. She's a Pentacostal, one of the most extreme branches of Protestantism. And she will be a heartbeat away from a 72 yr old President, if elected. So what is my alternative, you may ask, a possible Muslim under the influence of a black racist? My point is that this is no choice for Jews. The only choice you have is Eretz Yisrael. That is your destiny. And this "choice" (between religious extremes) is meant to make that very, very clear to you. Everything in the world is now revolving around religion. If you don't see that, open your eyes. Yeshayahu 31:1. "Woe to those who go down to Egypt for aid, and who rely on horses and trust in chariots which are many, and on riders who are very strong, and they did not rely on the Holy One of Israel and the Lord they did not seek." (IsraelNN.com) In an unusually strongly worded statement following the announcement of a cabinet debate on an "expulsion compensation" plan, Shas leader Eli Yishai said that the nation of Israel has not yet healed from "the wounds of the miserable expulsion" and already there are those "illegitimately cooking up a second expulsion." The government is "a de facto transition government and it is unworthy that someone from within it is leading to situations that the coalition partners find unacceptable," he said. It sure is---the one leading into the rule of Mashiach Tzidkeinu! This letter was first published in 1781 as an appendix to Ben Porat Yosef [p.128a] by Rabbi Yaakov Yosef of Polnoye, one of the Baal Shem Tov's chief disciples. Since then it has been republished many times in various books. This letter never reached its originally intended destination. This translation is based on the one in R. Aryeh Kaplan's Chassidic Masters, p. 12. The commentary and notes are based mostly on R. Yitzchak Ginsburgh's book Sod HaShem Lireiav, pp. 362-3 (Jerusalem, 1985). On Rosh Hashanah of the year 5507 I performed, by means of oath, an elevation of soul [to the higher spiritual realms], as known to you, and saw wondrous things I had never seen before. That which I saw and learned there is impossible to convey in words, even face to face. When I returned to the lower Garden of Eden [one of the levels of the abode of departed souls], I saw innumerable souls, both living and dead, some whom I knew and others whom I did not. They were fleeting back and forth, going from one universe to another through the Column that is known to those who delve in mysteries. Their state of joy was so great that lips cannot express it, and the physical ear is too gross to hear it. All of them beseeched and petitioned me unceasingly: "Because of the glory of your Torah, G-d granted you greater understanding to perceive and know these things. Ascend with us, so that you can be our help and support." The question which follows had already been posed to the Mashiach in Talmudic times by Rabbi Yehoshua ben Levi (Talmud Sanhedrin 98a). Then, the answer was: "Today", which was interpreted by the prophet Elijah as meaning: "Today - if you would only listen to G-d's voice" (Psalms 95:7). According to Rabbi Yosef Yitzchak of Lubavitch (Likutei Dibburim, Simchat Torah 5690, #30 [p. 618ff]), the Baal Shem Tov was in effect saying to the Mashiach: "We have already listened to His voice, even to the extent of giving up our lives in order to do so. Why, then, have you not come?" In the time when your teaching will become public and revealed in the world, and your wellsprings will burst forth to the farthest extremes, that which I have taught you and you have comprehended, and they also shall be able to perform unifications and elevations as you, and then all of the kelipot will cease to exist, and there shall be a time of good will and salvation." 1. "Your teachings will become public and revealed in the world": As is known, for most mystics and spiritual-focused people becoming a public figure is a very painful experience. Nonetheless, it is a challenge that must be faced if one's insights and teachings are to affect the world. 2. "Your wellsprings will burst forth to the farthest extremes" (Proverbs 5:16): His whole self, his "wellspring," must be revealed. If Mashiach is to come, everyone must be able to experience something of what it is like to be the Baal Shem Tov. 3. "That which I have taught you and what you have comprehended [yourself]": Expressible ideas and even those ideas that are inherently inexpressible must be revealed. 5. "All the kelipot will cease to exist and there shall be a time of good will and salvation": Evil can be eradicated and the transcendent light of G-d can shine. The eradication of evil on this level can be understood as seeing it as ultimately good. This, however, cannot be successfully accomplished without first attaining the previous four levels. For your sake, I made a request that I might be allowed to teach this to you, but permission was denied. I am still bound by this oath, but this may I inform you and may G-d help you, your way shall ever be in the presence of G-d and never leave your consciousness in the time of your prayer and study. And every word of your lips intend to unite (i.e., be aware of and meditate upon each word): for in every letter there are Worlds and Souls and Divinity, and they ascend and connect and unify with each other, and afterward the letters connect and unify to become a word, and [then] unify in true unification in Divinity. In every letter there are Worlds: These are the "three potent practices" alluded to earlier in the letter, and are among the basic teachings of the Baal Shem Tov. For a detailed description of this technique, see The Hebrew Letters by Rabbi Yitzchak Ginsburgh. referred to in the Zohar as "the bird's nest"; it is described in detail at the end of Etz Chaim. You will not find many comments from me on the US elections. I'm still not convinced Ole George will leave office. But what I'm beginning to hear from Jews about the Republican VP candidate has me concerned. Take today's article from Israel National News as a case in point. ...The Republican Jewish Coalition has pointed out that an Israeli flag is a fixture on the drapes in her office. "I think it speaks volumes that she keeps an Israeli flag on the wall of her office," the group's executive director, Matt Brooks, explained in an e-mail to Politico.com. "It clearly shows what's in her heart." "...Gov. Palin is a likely Israeli backer because she is 'a very religious person, and the religious Christians are the greatest supporters of Israel,' according to the Hawaii's Jewish governor, Linda Lingle, also a Republican." What neither the media nor the political pundits are going to expose, mainly because they are most probably completely unaware of it as yet, is the real danger of ending up with a President who is a Dominionist by belief and conviction. ...Gary Bauer, one of McCain's most enthusiastic evangelical supporters, said the Arizona senator had hit a "grand slam home run" and that adding Palin to the GOP ticket is "guaranteed to energize values voters." ...The 44-year-old mother of five, who led her high school chapter of the Fellowship of Christian Athletes, was baptized as a teenager at the Wasilla Assembly of God Church, where she and her family were very active, according to her then-pastor, Paul Riley. She now sometimes worships at the Juneau Christian Center, which is also part of the Pentecostal Assemblies of God, said Brad Kesler, business administrator of the denomination's Alaska District. But her home church is The Church on the Rock, an independent congregation, Riley said. The questions to ask here are: Who is Gary Bauer? And why is the Pentecostal connection important? Gary Bauer, a major figure of the Christian Right and former presidential candidate, has been a key organizer of campaigns linking rightist pro-Israel Christian groups and conservative Christian evangelicals. He is connected with, among many other things, Jerusalem Summit (International Advisory Board Chairman) and American Alliance of Jews and Christians (Cofounder, 2002). He is also a Dominionist, as are most of the Republican, right-wing, fundamentalist Xian, neo-Fascist politicians. ...Tattooed across [Todd Bentley's] sternum are military dog tags that read "Joel's Army." They're evidence of Bentley's generalship in a rapidly growing apocalyptic movement that's gone largely unnoticed by watchdogs of the theocratic right. According to Bentley and a handful of other "hyper-charismatic" preachers advancing the same agenda, Joel's Army is prophesied to become an Armageddon-ready military force of young people with a divine mandate to physically impose Christian "dominion" on non-believers. "An end-time army has one common purpose -- to aggressively take ground for the kingdom of God under the authority of Jesus Christ, the Dread Champion," Bentley declares on the website for his ministry school in British Columbia, Canada. "The trumpet is sounding, calling on-fire, revolutionary believers to enlist in Joel's Army. ... Many are now ready to be mobilized to establish and advance God's kingdom on earth." ...Joel's Army believers are hard-core Christian dominionists, meaning they believe that America, along with the rest of the world, should be governed by conservative Christians and a conservative Christian interpretation of biblical law. There is no room in their doctrine for democracy or pluralism. ..."As the church begins to take on this resolve, they [Joel's Army churches] will start to be thought of more as military bases, and they will begin to take on the characteristics of military bases for training, equipping, and deploying effective spiritual forces," Joyner wrote. "In time, the church will actually be organized more as a military force with an army, navy, air force, etc." Imagine Joel's Army patrolling the streets of America...or the streets of Jerusalem, G-d forbid! One thing is clear. 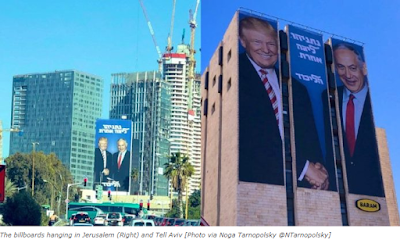 With the Democrats holding forth a candidate with ties to Islam, and the Republicans putting forth candidates with connections to the new Crusaders, there really is no longer any place for Jews. The question begs to be asked, why are these people making so many ties to Jews and Israel? They are expecting the imminent return of their false messiah and expect him to rule and reign from Jerusalem. Those who are already here to greet him will get choice positions of power in his new world government. They are expecting at least a third of Israel to "recognize" the "truth" of their false religion and mass convert and they feel that those Jews with whom they have made inroads will be the ripest for plucking. They intend to take over...by force if necessary. The lesson of all this is...don't be so easily taken in and stop looking for "friends" in high places. We have our own country to make something out of and we have HKBH. We don't need to curry favor with the goyim. It only makes us look bad and they have no respect for us. And anyway, they are on their way down and we are on the way up. Have some dignity and self-respect for a change. Stop being so needy for goyische approval. To hell with them all along with their nefarious plans!